Ever got tired seeing thiefs, who are trying to rob you blind on your travels on the main roads, wear expensive stuff like elven armor, elven guilded armor and even glass armor? Not anymore they will! This mod limits them to simple armors. I got tired of those simple robbers doning themselves in shiny armor like elven, elven guilded or even glass. In my current playthrough it was a thief like that who provided me with my first ever elven armor and this should not happen in my opinion. Think the same? Then this mod is for you. 1.) It is very unlikely for a normal thief to be able to obtain elven armor, let alone elven guilded armor or even glass armor. For obtaining the latter such an individual would have to take on, for instance, Thalmor, all by his own. 2.) Even if we asume for a moment that he is capable enough, he would probably not wear it in public. Any kind of shiny, expensive looking armor is unsuited for a thief who hides in the bushes. It looks out of place. 3.) Any faction armor was deleted from their leveled lists aswell. Doning yourself in imperial armor in a hold that is Stormcloak teritory? Not a very bright idea. Yet still imperial armor in all its variations was part of the vanilla leveled lists for thieves! to see which files it included). 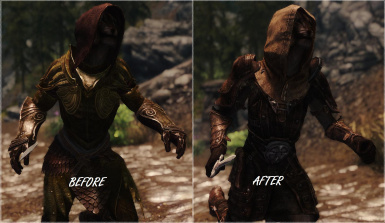 This mod directly changes three leveled lists of the ordinary roadside thief. So the changes are very little. Obviously, any other mod that does the same changes is incompatible to this one. Read the section "Mod Load Order". I'd recommend this to be somewhere at the start of the load-order, before any other item-mod, or NPC mod. and in case of incompatibility you'd rather have a more important mod to take priority. Well...it's really a simple mod, isn't it. If you want to use it, include it or do anything else just do it. If you directly take the files it would be fair to credit me though.